Milestone inscribed in Greek and Aramaic. Taḵt-e mādar-e Soleymān (lit. 'Throne of the mother of Solomon') or Tall-e Taḵt (lit. 'Throne hill'). Pasārgād (Pasargadae), Fārs province, Iran. Last quarter of the fourth or early third century BC. Excavations of D. Stronach (British Institute of Persian Studies), 1961-1963. National Museum of Iran. H. 0.36 m, W. (restored) 0.105-0.30 m, Th. 0.17 m.
[ . ]Ν[ . . ] ΠΟΙΟ[..]Α.
Greek text after Rougemont, G. 2012. Inscriptions grecques d'Iran et d'Asie centrale, avec des contributions de Paul Bernard. Corpus Inscriptionum Iranicarum, part II, vol. I.1. London: no. 65. Reproduced by permission of Georges Rougemont and the Corpus Inscriptionum Iranicarum. Aramaic text on face B after Bivar, A. D. H. 1978. 'The Aramaic summary.' In Stronach, D., Pasargadae. A Report on the Excavations Conducted by the British Institute of Persian Studies from 1961 to 1963. Oxford: 161-162. The whitish limestone merlon is stated to have been ‘found above the latest floor of Courtyard 16, within the Achaemenid-Seleucid citadel at Pasargadae, in debris that postdates the overthrow of Seleucid rule in Fars c. 280' (Lewis 1978: 160; Stronach 1978: fold-out plan of excavation after p. 146, pls. 135-136; but see also, e.g., Askari Chaverdi and Callieri 2010, for a proposed revision of the chronology of the Seleucid layers on the Tall-e Taḵt, and Canali De Rossi 2004: no. 248, for the uncertain date of the end of Seleucid rule locally). The shape of the merlon was common in Achaemenid architecture. 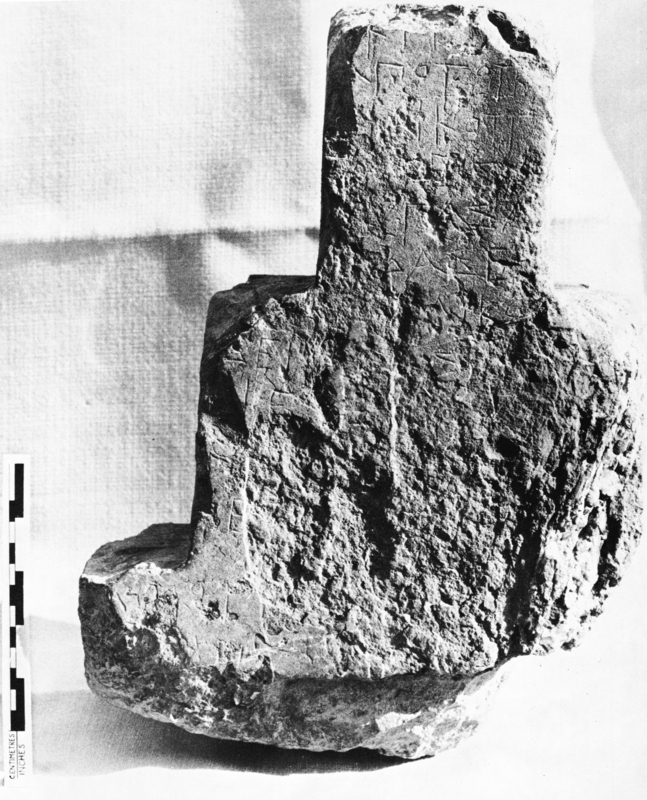 The badly mutilated Greek texts on either side of the stone —both texts cut by the same hand, on the same occasion (Lewis 1978: 161)— are datable during the era of Greek-Macedonian occupation at the site. In the opinion of different commentators, the carving of these texts could be set during the governorship of Alexander's commander in Persis, Peucestas, in 324-316 BC (Bernard 1995: 75-76 with n. 43), or the reign of the first Seleucid rulers (after 311 BC, Rougemont 2012: no. 65, p. 132), or more likely the last decade, 290 - ca. 280 BC, of the reign of Seleucus I (Lewis 1978: 161), or, perhaps, even as late as the reign of Antiochus IV in 175-164 BC (Canali De Rossi 2004: no. 248). 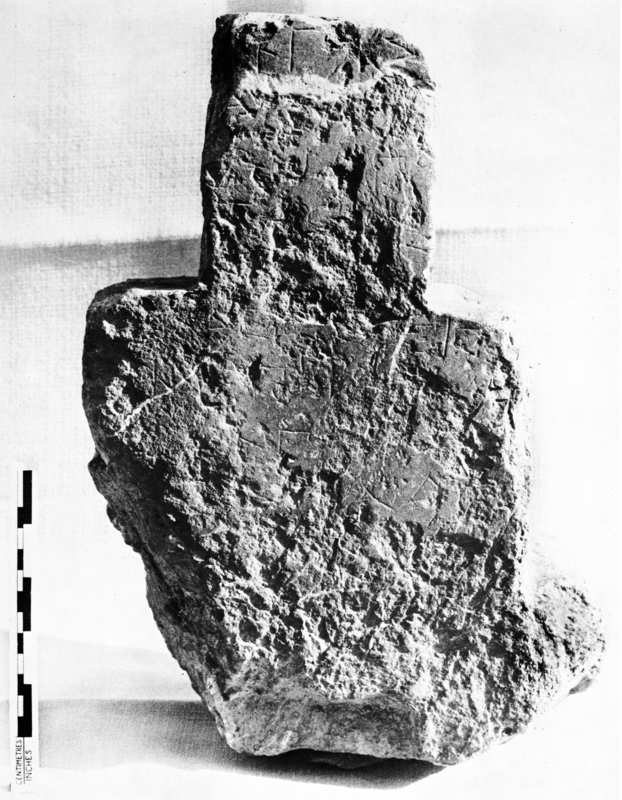 Traces of two lines of a further, Aramaic inscription are discernible below the Greek text on face B (Bivar 1978). The inscribed merlon is always likely to have been erected initially on the Tall-e Taḵt. Registering, as it presumably did, distances from and to Pasargadae, this inscribed document signals the function of the latter Achaemenid capital, and subsequent Alexandrine-Seleucid local administrative center, as a starting point for the measurement of road distances (Bernard 1995: 77). At the same time, like the Seleucid milestone from Marvdašt, it speaks for the continuing maintenance of the Achaemenid routes in Fārs under Greek-Macedonian rule (Callieri 2007: 34; Aperghis 2008: 141). A further instance of continuity between Seleucid and earlier Achaemenid practice may be implied by the Aramaic inscription on face B, which possibly indicates that, in parallel with the introduction of Greek as a state language, the Aramaic idiom and scribal tradition of the Achaemenid chancery was perpetuated under Alexander and the Seleucids (cf. Bivar 1978: 161). Aperghis, G. G. 2008. 'Managing an empire – teacher and pupil.' In Darbandi, S. M. R. and Zournatzi, A. (eds. ), 1st International Conference, Ancient Greece and Ancient Iran: Cross-Cultural Encounters, Athens, 11-13 November 2006. Athens: 137-147. Askari Chaverdi, A. and Callieri, P. 2010. 'Preliminary report on the Irano-Italian stratigraphic study of the Toll-e Takht, Pasargad. Investigations on the material culture of the Achaemenid and post-Achaemenid periods in Fars.' In Macuch, M., Weber, D. and Durkin-Meisterernst, D. (eds. ), Ancient and Middle Iranian Studies. Proceedings of the 6th European Conference of Iranian Studies, held in Vienna, 18–22 September 2007. Wiesbaden: 11-28. Bernard, P. 1995. 'Remarques additionnelles’ [to Callieri, P. 'Une borne routière grecque de la région de Persépolis']. Comptes rendus des séances de l'Académie des Inscriptions et Belles-Lettres: 73-95. Bivar, A. D. H. 1978. 'The Aramaic summary.' In Stronach, D., Pasargadae. A Report on the Excavations Conducted by the British Institute of Persian Studies from 1961 to 1963. Oxford: 161-162. Huyse, Ph. 1996. 'Die Rolle des Griechischen im "hellenistischen" Iran.' In Funck, B. (ed. ), Hellenismus: Beiträge zur Erforschung von Akkulturation und politischer Ordnung in den Staaten des hellenistischen Zeitalters, Akten des Internationalen Hellenismus-Kolloquiums 9.-14.März 1994 in Berlin. Tübingen: 57-76. Lewis, D. M. 1978. 'The Seleucid inscription.' In Stronach, D., Pasargadae. A Report on the Excavations Conducted by the British Institute of Persian Studies from 1961 to 1963. Oxford: 160-161. Stronach, D. 1978. Pasargadae. A Report on the Excavations Conducted by the British Institute of Persian Studies from 1961 to 1963. Oxford. Wiesehöfer, J. 1994. Die 'dunklen Jahrhunderte' der Persis. Untersuchungen zu Geschichte und Kultur von Fārs in fruhhellenistischer Zeit (330-140 v. Chr.). Zetemata 90. Munich.